Arijit Raychowdhury received the 2018 IEEE/ACM "Innovator Under 40 Award" at the Design Automation Conference, held June 24-28 in San Francisco, California. He is the ON Semiconductor Junior Professor in the Georgia Tech School of Electrical and Computer Engineering (ECE). The award is intended for specific contributions such as commercial products, software or hardware systems, or specific algorithms or tools incorporated into other systems widely used by industry and academia. The impact is measured by commercialization and wide adoption of the nominee’s contributions. 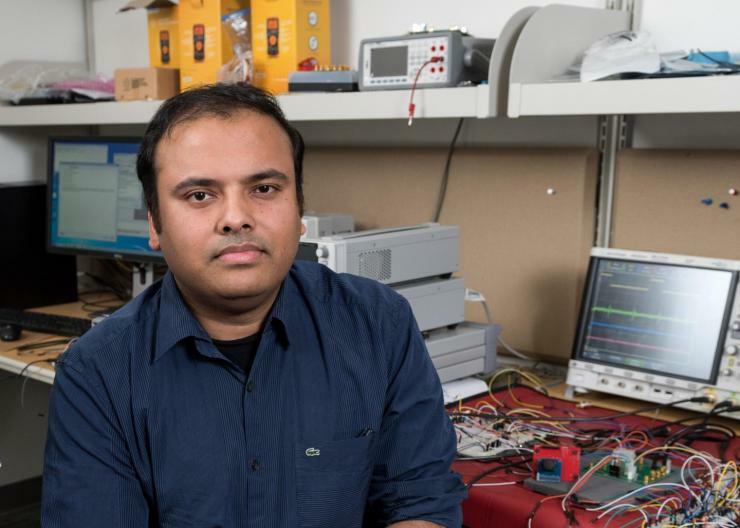 Prior to attending graduate school, Raychowdhury first worked as an analog researcher at Texas Instruments (TI) for two years, where he designed the world's first adaptive mixed-signal echo-canceller for the receive-channel in ADSL modems. It used a hardware based optimizer for impedance matching and resulted in 1.5X range improvement. Raychowdhury holds two key patents in this area, and the design eventually was adopted by three generations of TI modems and was awarded the EDN design of the year award. After receiving his Ph.D., Raychowdhury joined Intel Labs as a research scientist where he led the design of "always-on" smart microphones, which led to a design win with BMW and led to the adoption of the technology in automotive infotainment systems. This was the industry's first hardware design that incorporated an ultra-low power microphone-sensor front-end with a fully-programmable keyword-spotting hardware. Since joining Georgia Tech in 2013, Raychowdhury has been exploring various aspects of power-efficient design. Most notably, his students and he contributed to the development of switched-mode and non-linear control in high-bandwidth all-digital, linear regulators that have gained wide traction with the semiconductor companies. The design principles have been adopted in internal test-chips and system prototypes at Qualcomm and Intel. Raychowdhury was nominated for this IEEE/ACM award by researchers and engineers from Qualcomm, TI, TSMC, and Intel with support from Georgia Tech and the University of California, Berkeley.